According to ancient Norse tales, the first meeting between Norwegians and Scots took place in the Viking-Age, at the time when the legendary king Harald hårfagre (“fairhair”) sent a fleet against North-Sea pirates. Back then, in the late 9th-century, numerous Vikings had established themselves in various locations within the British isles and sometimes even ended up targeting the Western areas of Norway as well. However, King Harald fairhair, who, according to legend was the first monarch to rule over a unified Norway, could not let such offenses pass. Leading the fleet was the king, who was able to count on the support of numerous of his allied landed men. Among them was Ragnvald Øysteinsson, the ruler of the counties of Møre and Romsdal, in North-Western Norway. Due to their geographical proximity to Norway, it was in the Shetlands and the Orkneys that most of the Vikings who preyed on Harald fairhair’s land were located. Their main strategy usually was to lay low in the North-Scottish islands in the winter before spending the summer months on their boats, raiding settlement after settlement. Instead of waiting for the Vikings to come to Norway, the king simply decided to raid their home bases before they could once more set sail. Soon enough, the Norwegian longships had reached the Orkneys and Shetlands and the Vikings were routed. Unsatisfied with this status quo, the Norwegians then decided to head for the Hebrides, which were soon conquered as well. After reaching the Irish sea and laying waste to the isle of Man, Harald decided to head back home, confident that the Viking threat had been all but extinguished. Still, as a final precaution, he decided to leave a part of his army behind to rule over the newly-subjugated territories. Taking into consideration the support he had just received from Ragnvald, Harald offered the tenure of Orkneys to his family. 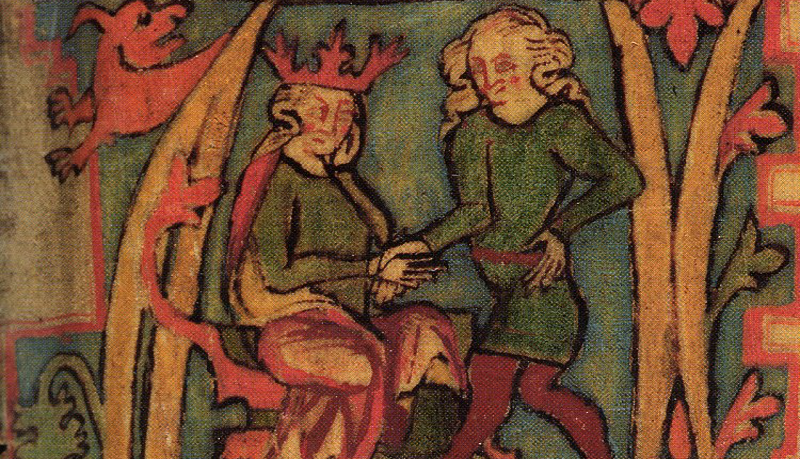 As Ragnvald had to head back home to continue ruling over Møre and Romsdal, he appointed his brother, Sigurd, to become the first Norse Earl of the Orkneys. Under Sigurd’s rule, the Norwegians were able to expend further south all the way into Caithness, Moray and Ross. These early conquests set the stage for the establishment of one of the most powerful and long-lasting Norse enclave outside of Scandinavia, a powerful dynasty that would thoroughly entwine the destinies of Norway and Scotland for the centuries to come. (1) Orknøyingenes Saga (19970. Trans. Anne Holtsmark. Oxford: Oxford World’s Classics. (I) Anonymous illumination showing Harald fairhair receiving the kingdom of Norway from his father. From the 14th-century Icelandic Flateyarbók manuscript.